PRE-ORDER: Once you find a made-to-measure item you would like to purchase, read the instructions on how to take measurements accurately. You can view videos showing how to take measurements directly from your body as well as from an existing, well-fitting garment, depending on the measurement form required. You can e-mail us with any questions or concerns regarding your measurements. Once you have finalized your measurements, please upload them into your account. You are now ready to place your order. You will receive a confirmation e-mail that your order has been received. PRE-PRODUCTION: Once your order is placed, we will process your order within three days and you will be sent a confirmation e-mail stating the approximate wait time. If your order is for a standard item in our catalog using one of our standard materials your order will immediately enter the waiting queue. If you requested a custom material, this will have to be sourced, which takes about one month. If you order is fully custom, the design work could take several months, but we will keep you updated via e-mail with design sketches, material options, etc. 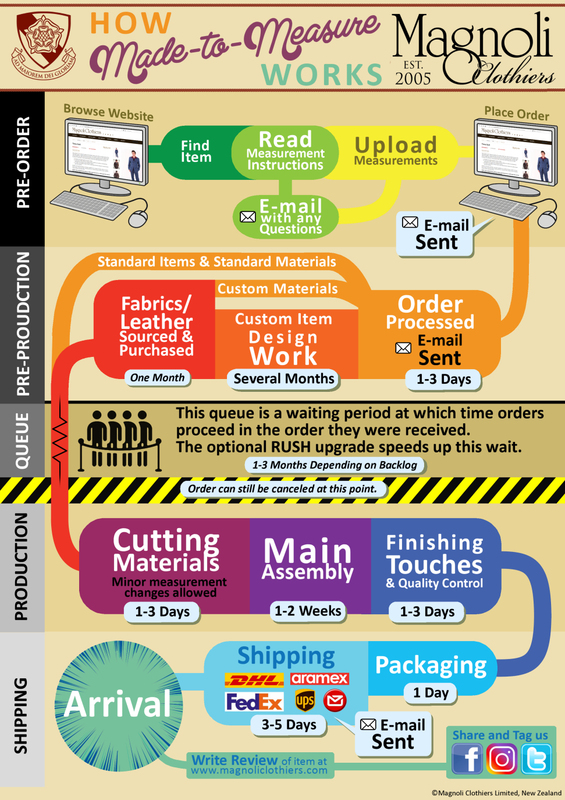 QUEUE: Once your order is processed and all materials are in stock and ready for cutting, your order will enter the wait queue. The length of wait is based on our backlog of orders at any given time, priority of orders as well as holidays and other such factors. The usual wait time is anywhere from one to three months. Sometimes orders for similar items are grouped together to speed up production. If you have upgraded your order to RUSH processing, you are put at the head of the queue and your order is started as soon as possible. NOTE: Orders can still be canceled with no penalties up until this point. Once your garment enters production, the order cannot be canceled due to the waste of materials. In some cases we may still be able to cancel your order in the later stages of production with minimal fees. Cutting Materials: During this stage the fabric and/or leather is measured and cut based on the measurements required by our patterns and your specifications. At this point, minor changes in measurements may still be possible. This process generally only takes a couple of days. Main Assembly: This is the actual construction of your garment, including the lining and all major components. This is the bulk of the production time, taking anywhere from one to two weeks. Finishing Touches & Quality Control: Buttons, zippers, trims and other small details are added to your garment. Before packaging, your garment is checked for quality of construction, accuracy to the patterns and consistent to the details requested. SHIPPING: Your order now complete, garments are prepared for shipping, bagged and packaged. All made-to-measurements are shipped via express courier and usually take less than a week to arrive. When your item arrives, we would appreciate if you could write a review of the item on our website. Feel free to also post reviews on our Facebook page as well as share photos on your favorite social media websites. Please remember to tag us in your photos!